OU News: Osmania University Vice Chancellor Prof Ramachandram said they would fill 415 vacant professor posts soon. The VC said he addressed a letter to the State government seeking permission to issue job notification. The university will release notification in July second week in case the government gives permission in this regard. He said the university would conduct screening test depending on the number of applications and interviews to be conducted to the eligible candidates. Age Limit: “The relaxation of age limit is extended to all the qualified candidates in addition to the in-service people for appointment of Associate / Assistant Professor in the University service”. Hence, there is no upper age limit for all eligible candidates. a) BE/B.Tech and ME/M.Tech. (Chemical Engineering) with First Class or equivalent either in BE/B.Tech. or ME/M.Tech. and Ph.D. or equivalent, in appropriate discipline. c) Minimum of 5 years experience in teaching/research/industry of which 2 years post Ph.D. experience is desirable. i. Good academic record with a Ph.D. Degree in the concerned/allied/ relevant disciplines. academic/research position equivalent to that of Assistant Professor in a University, College or Accredited Research Institution/Industry excluding the period of Ph.D. research with evidence of published work and a minimum of Five (5) publications as books and/or research/policy papers. v. A minimum consolidated API score requirement of (300) points from category-III of APIs. i) Good academic record as defined by the concerned University with at least 55% marks (or an equivalent grade in a point scale wherever grading system is followed) at the Master’s Degree level in a relevant subject from an Indian University, or an equivalent degree from an accredited foreign university. ii) Besides fulfilling the above qualifications, the candidate must have cleared the National Eligiblity Test (NET) conducted by the UGC, CSIR or similar test accredited by the UGC like SLET/SET. 2009, shall be exempted from the requirement of the minimum eligibility condition of NET/SLET/SET for recruitment and appointment of Assistant Professor or equivalent positions in Universities/Colleges/Institutions. 1. The latest passport size photograph should be affixed to the application form. 2. The University reserves the right to reject any application without assigning any reason. 4. Candidates already in service must submit their applications through proper channel. They may, however, send an advance copy but, if called for interview, they must produce a “No Objection Certificate “ from their employer. 5. Candidates will have to present themselves for an interview at their own expenses. 6. Candidates should bring all “Certificates in Original” for the interview. 7. Incomplete applications are liable to be REJECTED. 1. The eligible candidates can apply in the prescribed form together with a registration fee of Rs. 500/- through Demand Draft drawn in favour of Registrar, Osmania University payable at Hyderabad. 2. Application form along with the details of qualifications, and the relevant conditions etc., can be obtained from the Director, Departmet of Publications and Press, Osmania University, Hyderabad- 500 007 on payment of Rs.75/- in person or by post by sending a D.D. for Rs.100/- drawn in favour of the Director, Department of Publications and Press, Osmania University, Hyderabad 500 007 along with a self-addressed envelope. 3. 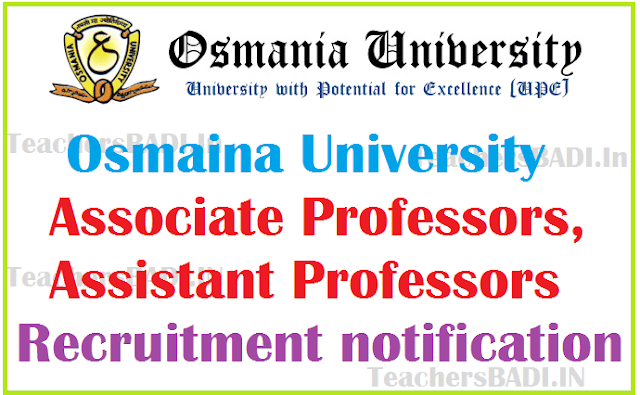 Application form and details can also be downloaded from the University Website www.osmania.ac.in. The filled in downloaded forms are accepted with a registration fee of Rs.575/- payable through Demand Draft only, drawn in favour of the Registrar, Osmania University, Hyderabad – 500 007, A.P., payable at Hyderabad. 4. The filled in applications should reach the undersigned in person or by Post by 5.00 p.m. on or before 28-07-2014. The University is not responsible for any postal delay. Any proof of posting/dispatch shall not be entertained for applications received after the last date.